-Global Hotkey support for automatically showing and hiding the File Cabinet window! This feature is disabled by default, however, you can go to settings and turn it on if you’d like. You can set your own hotkey or use the default hotkey we suggest. Please note that File Cabinet will do its best to prevent you from choosing a hotkey that will likely cause a conflict with other apps. For example, you can’t set the hotkey to Command+C because you wouldn’t be able to copy a selection to the clipboard. 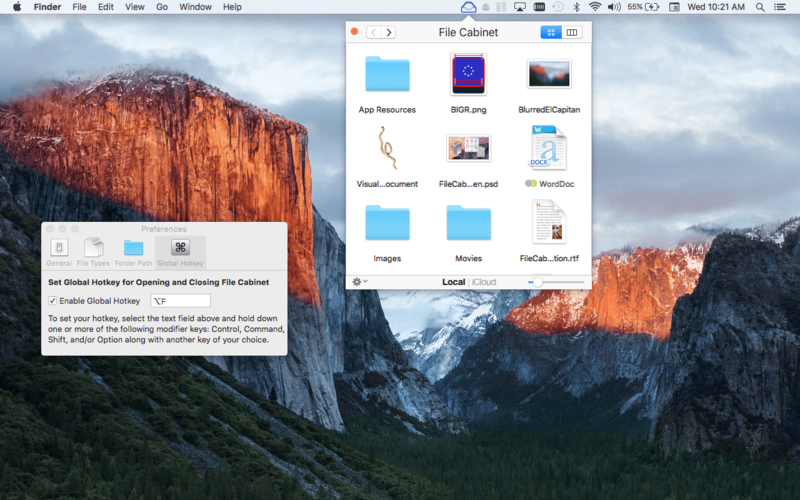 -The icon in the menubar now changes to dark blue when File Cabinet Pro is the focused app. It will change to black when File Cabinet Pro is not the focused app. -You can now “Go Back” by using the Command+[ keyboard shortcut. -You can now “Go Forward” by using the Command+] keyboard shortcut. -Major performance improvements, especially when viewing a directory with lots of files in it. -Users on OS X El Capitan will enjoy additional performance improvements when viewing directories in Icon View because we now take advantage of new API Apple introduced in OS X El Capitan.